When it comes to keeping your trees healthy and beautiful, you want someone who is knowledgeable and trained in the art and science of tree care. After all, pruning or removing trees can be dangerous, and poorly maintained trees can adversely affect your landscape, and even lower your property values. If you want well-cared-for trees, hiring an International Society of Arboriculture (ISA) Certified Arborist is the way to go. Of course, you don’t have to hire a Certified Arborist to remove or prune your trees – you can hire anyone you like. But will he know how to remove a tree safely in order to prevent damage to your property or utilities? Will he know which limbs and branches to prune so that the tree’s structure and health will be maintained? Will he know how to properly grind a stump so that regrowth is prevented and the area can be easily planted over? 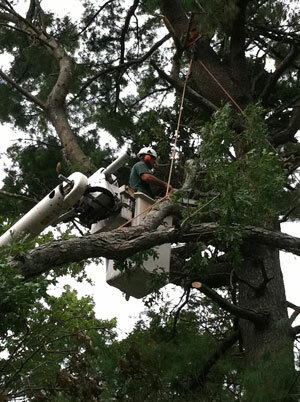 By choosing not to work with an ISA Certified Arborist, you may be taking a big risk. Pruning or removing trees is difficult, dangerous work, and you need someone that you know can do the job safely and efficiently. With an ISA Certified Arborist, you can rest easy knowing that your tree care needs are being met. Surprisingly, those who provide tree care services are not required to obtain ISA certification – it’s completely voluntary. However, those who choose to go through the certification process show their commitment and dedication to the tree care industry, and those who have the required experience and pass the comprehensive examination demonstrate that they have the knowledge and the know-how needed to correctly care for your trees. ISA Certified Arborists are also required to continue their education in order to stay certified, which means they’re more likely to be up-to-date on the newest tree care techniques and developments. Proper tree care is an investment that can pay off big by improving the look of your landscape and boosting your property value. Protect your investment by hiring an ISA Certified Arborist to keep your trees safe, healthy, and beautiful.